Hairy Vetch grows slowly in fall, but root development continues over winter. 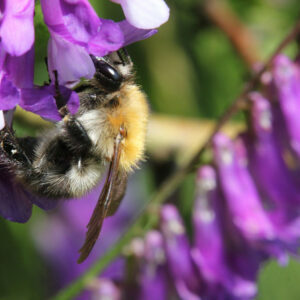 Growth quickens in spring, when hairy vetch becomes a sprawling vine up to 12 feet long. Field height rarely exceeds 3 feet unless the vetch is supported by another crop. Hairy vetch is often used for root zone water recharge over winter by reducing runoff and allowing more water to penetrate the soil. By adding grasses that take up a lot of water into your cover crop mix it can reduce the amount of infiltration and reduce the risk of leaching in soils. An oats/vetch mix has been found to greatly decrease surface ponding and soil crusting in loam and sandy loam soils, rather; hairy vetch improves topsoil tilth and creates loose and friable soil structures. Hairy vetch is more drought tolerant than other vetches. It needs a bit of moisture to establish in fall and to resume vegetative growth in spring, but relatively little over winter when above-ground growth is minimal. 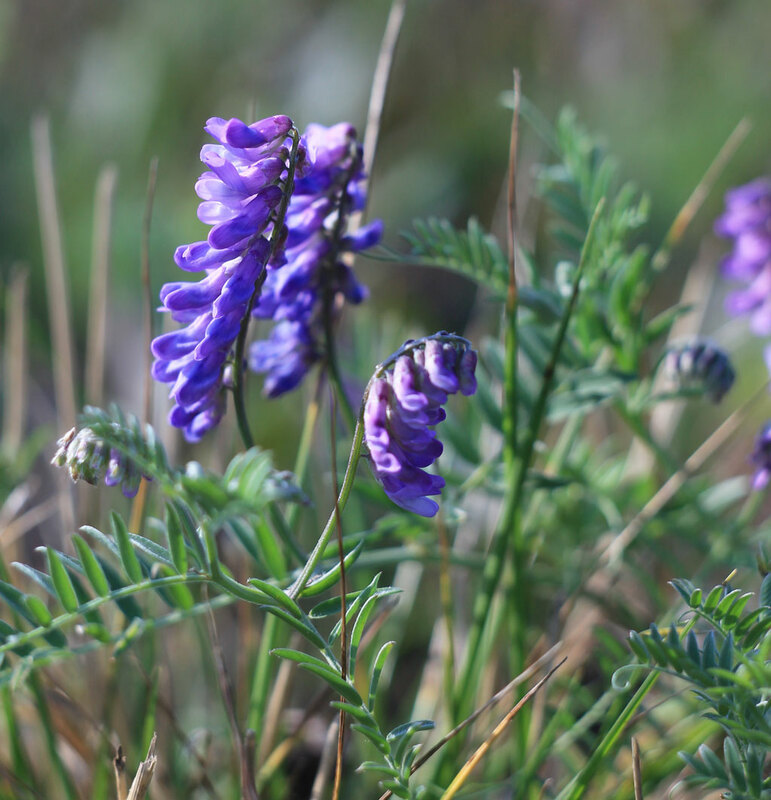 Hairy Vetch is also known as Winter Vetch and Sand Vetch. Hairy vetch is a legume used primarily for soil improvement along roadsides and for bank stabilization, but it is also grown for pasture. It is tolerant of a wide variety of soils, including poorly drained soils and low pH (5.5 or lower, though 6.0-7.0 is ideal. It withstands trampling, provide grazing during May and June and have a feeding value slightly lower than that of clover and alfalfa. The protein content of vetch hay ranges from 12 to 20%, depending on the stage of development of the crop when cut. Hairy Vetch is a great pollinator species for the promotion of beneficial insects, bee populations and honey production. Why use it as a cover crop? Use hairy vetch as a good cover crop choice where spring forage production and nitrogen contribution are desired. Though fall-planted hairy vetch may not have evident top growth, strong root development continues over the winter. Growth accelerates in the spring when plants can reach 12 feet in length. This viny growth can be very beneficial, as it smothers weeds and is a great nitrogen contributor; however, it can also be a challenge, as it is sometimes difficult to manage with hay cutting equipment. Vetch is often grown with a small grain for forage. The grain supports the weak stems of the vetch and reduces lodging. This vetch is usually grown as an annual or winter annual. When hairy vetch is sown in late July or August, the seed germinates readily and the plants generally form a crown before the first snow. In spring, the plant produces 3 to 10 long, weak, branching stems or vines 3 to 6 ft long. 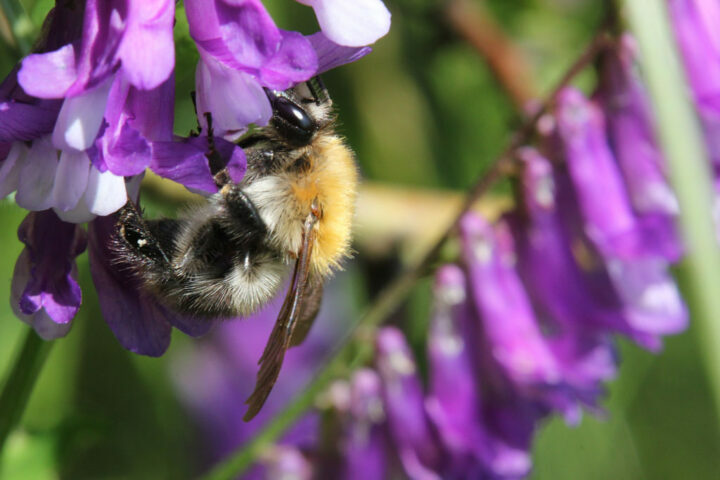 The purple and white flowers appear in mid-June and are borne in a cluster. Seed pods, bearing 4 to 8 seeds each, mature unevenly from July 10 to July 25. Pods tends to shatter soon after maturity. When hairy vetch is spring sown, it will bloom and produce some seed the same season. 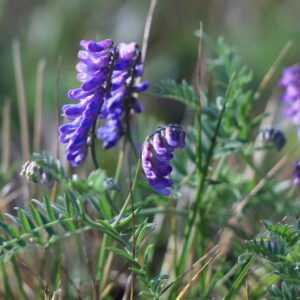 Hairy vetch is the most winter-hardy of the commercial vetches, though it may not survive a winter without a snow cover. Plants on poorly drained soil will kill more easily than those on well-drained land. Late seeding and unusually cold fall weather also result in more winter injury. Protective covering by a companion crop or crop waste reduces the danger of winter kill. Hairy vetch will not successfully overwinter in many northern areas of the Midwest. Check on the adaptability of hairy vetch to your location before planting. Is Hairy Vetch Drought Resistant? Although the vetches are not drought resistant, this is rarely a problem. The crop is summer-seeded and harvested the following July before the hot, dry conditions of late summer. Vetches grow well on a wide range of soil types, but are best adapted to loamy and sandy soils. It can be grown following any crop harvested before mid- August. Vetch seeded into small grain stubble need not be plowed or disked before sowing. The stubble may provide enough winter protection to overwinter a vetch crop by holding snow on the field. Plowing or heavy disking is essential on heavy soils and firmly packed soils, or where there is heavy weed infestation. Grassy fields should be plowed or thoroughly cultivated during July before planting vetch. In central Wisconsin or Minnesota, the best time to plant vetch is from July 25 to August 30. Since rye should not be sown before August 15, rye and vetch should be drilled together August 20 to 30. Hairy vetch is the most winter-hardy of the vetches. 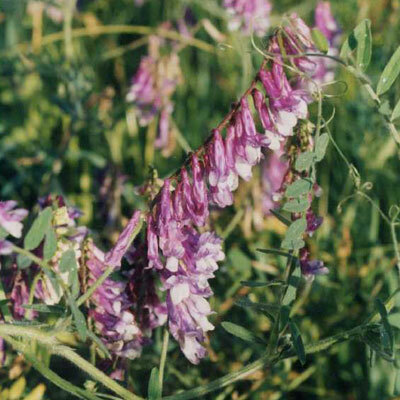 It is the only vetch that can be grown in the Upper Midwest. ** This item has a 5 pound minimum order quantity. ***For more info, click the “Additional Information” tab above.